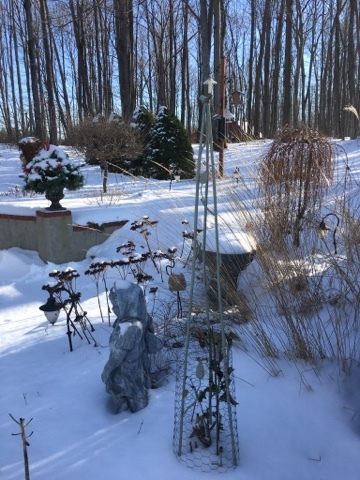 Home and Gardening With Liz: Happy January 2016! I'm so pleased it's a new year! Time for new things to do and hopefully some goals to be reached! We had a nice sun shiny day for a change so I snapped a few outdoor pictures. This is my favorite shot. 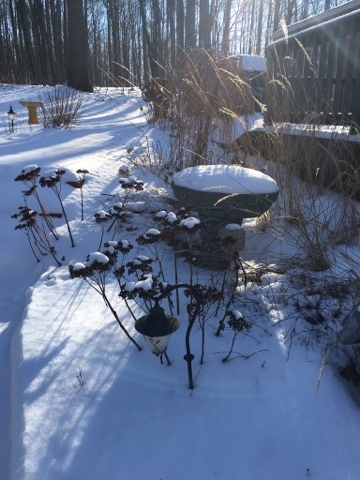 In the winter things change so quickly I figured I better take a few pics. Before long we'll have a couple of feet of snow on the ground and most of this will be buried. We ran to SAMs Club to stock up on some important things like T.P. and Kleenex, etc. 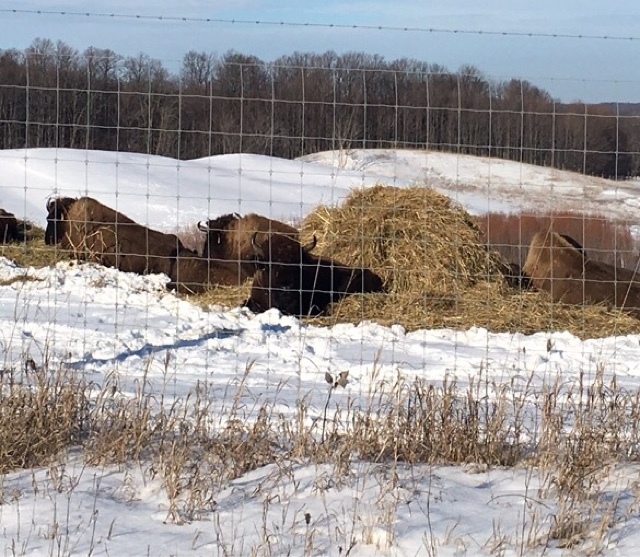 On the way back I noticed the buffalo basking in the sun while contenedly chewing on their hay. I've mentioned about the buffalo on my blog before but these are some locally raised buffalo by the Oleson family for their grocery store and some restaurants. Sometimes they are up on this hill close to the road. Too bad the detail isn't greater. His big eyes were staring right at me! 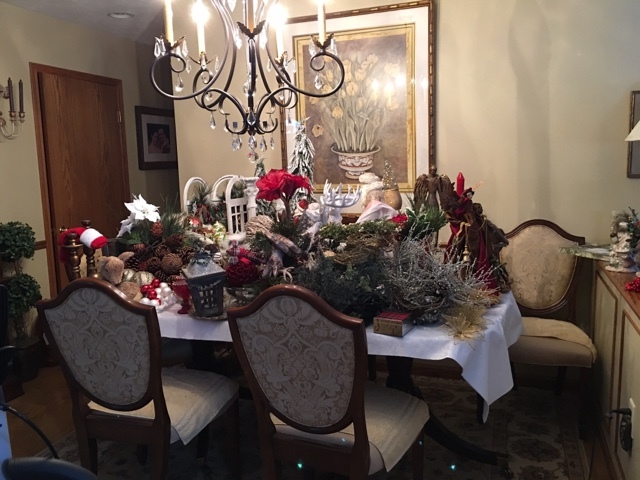 I piled my Christmas stuff on the dining table. I'm working at putting it away. Hopefully I'll be done in the next day or two. I shoved the table and chairs to the corner to give me more room to work. This makes me question my sanity! I saw this passing around on Facebook and thought it was too precious! I forgot to show you something very special to me! A friend of ours does some wood carvings in his spare time. In a conversation I mentioned I had my eye on a swan to purchase from Ballard Designs. To my surprise he carved one for me! He gave it to Dan unfinished and Dan painted it. I can't tell you how surprised and tickled I was to get this for Christmas! Right now it's on the mantel (which isn't even dusted after removing the Christmas deco yet). I plan for it to go in the guest room downstairs that is finished in a cabin/nautical design. I guess that's another project for me to get into. 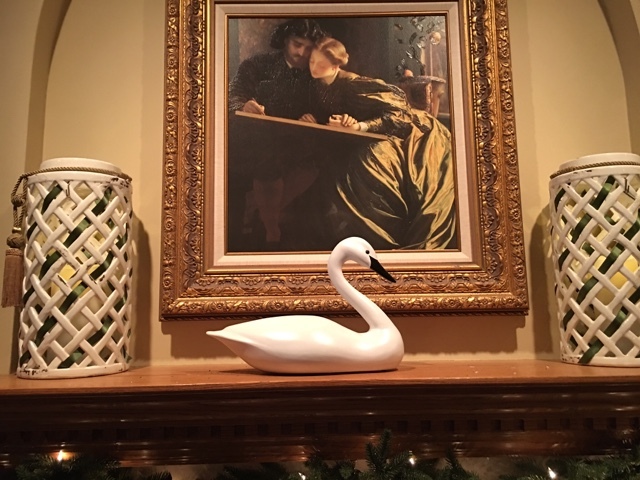 I have a shelf to clear and need to give this swan a nice spot! Thank you again to Linda my Blog Fairy for giving my blog another new look! That's all for now- have a great day! Happy New year! Love the bunnies and the toddler. It feels good to have Christmas all put away. It was a chore. The house looks rather bare. Sorry again for the family's loss. Here's to a bright new year. Cheers. Great pictures Liz! That pic on facebook is adorable too! Liz...Happy New Year!! Great photos! Yes, I'm sure *snow* will soon cover everything! 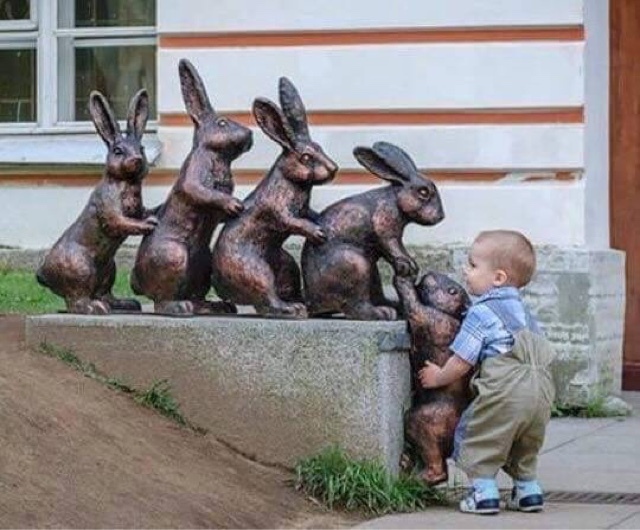 Love the little boy and the bunnies! The swan is gorgeous, what gift some folks have! (And your hubby did an amazing job painting it!! Blessings.. Happy New Year to you!! Great photos and love the bunny photo!! Too Cute!! Happy New Year, dear Liz! Oh, isn't the snow lovely? 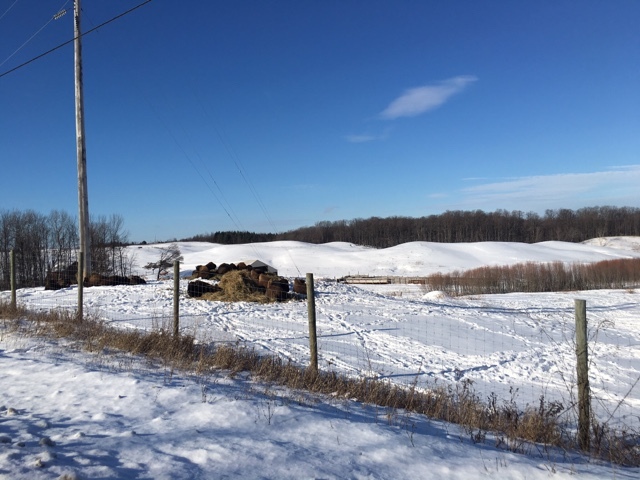 We've enjoyed this mild winter and our snow looks about like your. Just saw on the news tonight that this time last year we had 26" on the ground compared to 3" now! ;) Those buffs are really very neat to look at but I do believe I'd be a bit afraid of them! What a wonderful surprise for you. The swan is just beautiful. I've always loved those too. Thanks for popping in and here's to another wonderful year of blogging with you. I think we're all in the same thought of mind, as you, dear friend!!! filling our time with the wonders of Winter!!! I enjoyed your photos of the buffalo!!! in the right side bar!!! Hi Liz, oh that FB pic is just too cute. 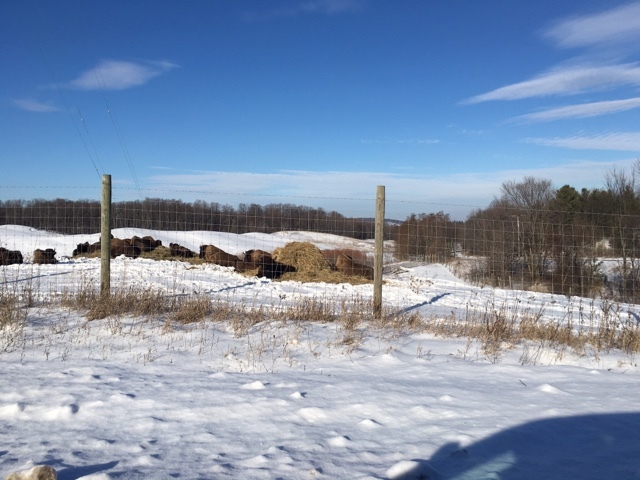 Great pics of the buffalo keeping warm curled up in the hay. I do the same thing when I put the decorations away. Gather it all up and piled it on the table then fill up the tubs. All done here finally and it looks so bare. The snow looks so beautiful and how great that you see buffalo on your drives!...You must have been over the top excited to receive that gorgeous swan! What a most wonderful gift and so very special that he handmade it especially for you! A true treasure! Happy New Year Liz!!! Happy New Year Liz! I just love your beautiful swan! What a sweet and thoughtful gift.